After fourteen years of leaps in animation and mainstream superhero movie saturation, Pixar’s Incredibles 2 has finally arrived. The sequel to the 2004 original wastes no time getting back to the superheroic adventures of the Parr family. In fact, it picks up right where The Incredibles left off: with the attack of the mole-like villain the Underminer. This prologue highlights how far computer-generated animation has come in such a short time. The crowds are bigger, the hair is nicer, and the characters are more expressive in the subtlest ways. Everything has a fresh layer of digital paint, and it is a credit to their designs that the characters still look hold up with these updates. The film’s plot is appropriately crowded. A tech mogul named Winston Deavor (Bob Odenkirk) approaches Helen/Elastigirl (Holly Hunter) with a proposition: work for him and help show the world that Supers exist to help people and should be allowed to fight crime once again. His sister, a boozy brunette named Evelyn (Catherine Keener), seems less enthusiastic, but provides Elastigirl with a snazzy new motorcycle. While Helen is off on her new job, Bob/Mr. Incredible (Craig T. Nelson) is playing stay-at-home dad and attempting to balance Violet’s (Sarah Vowell) teen angst, Dash’s (Huck Milner) math homework, and baby Jack-Jack’s numerous abilities (which include multiplication, laser eyes, and demonic transformations). The polar opposite from the original’s Syndrome, the villainous Screenslaver is attempting to take control of ordinary people through his hypnotic television broadcasts. He is creepy, and stays in the shadows while Elastigirl hunts him down. Their confrontation is remarkably animated, and worth the price of admission. 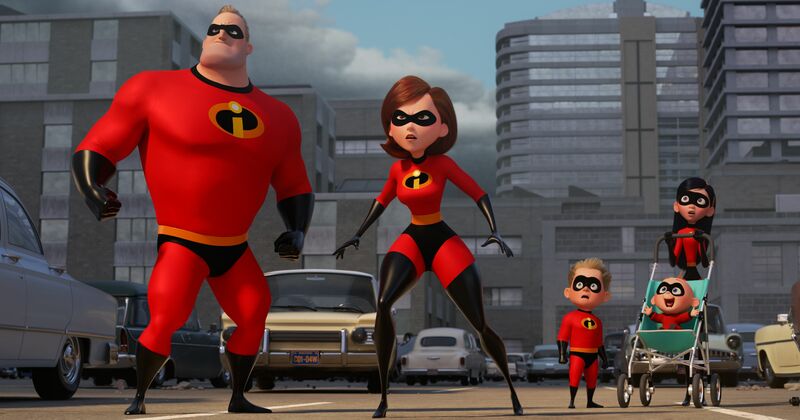 Incredibles 2 does a lot of things the Marvel movies could learn to incorporate. Each character has clearly defined powers used in unique ways; they aren’t just vaguely strong like half the men in the Marvel universe (Okay, Mr. Incredible’s power is super strength, but he can’t do super jumps or anything like Captain America). These abilities help create some delightful action sequences, my favorite of which had Violet using her forcefields as enhanced fists taking on newcomer Voyd’s physics-warping portal powers. Bird knows how to work effortlessly in animation, and takes full advantage of this cartoon reality. Jack-Jack’s fight with a raccoon is Looney Tunes in tone, but doesn’t take away from the seriousness of the main plot. The third act ends up a bit rushed, but the action remains exhilarating to the end. It should be noted that Incredibles 2 was moved up by an *entire year* to replace the long-delayed Toy Story 4 (which I’m still not sure is even happening). Animation is extremely time-consuming, so the fact that this film is coherent at all is a massive achievement. All in all, the film is a worthy successor to the original, and I’m looking forward to whatever Brad Bird does next. As long as it’s not Tomorrowland 2.